Before Marvel stepped in and put the brakes on things at Sony with regards to the Spider-Man franchise, they had a list of potential spin-offs in the pipeline including one preposterous project that would star a young Aunt May as some sort of Agent Carter type of character, completely inventing a history the character never had. That pushed the folks at Marvel too far, and after two not all that successful Spider-Man reboots with Andrew Garfield, Marvel felt it was time to step in and right the ship before it sank completely. A successful introduction of new Spider-Man Tom Holland in the Marvel Cinematic Universe proper and in his own Sony movie has fixed things very well indeed. So how did they let the Venom character slip through their fingers? Venom stars Tom Hardy as journalist Eddie Brock, more troublemaker than troubleshooter. He has a successful investigative news program but his boss wants him to interview Carlton Drake (Riz Ahmed), an Elon Musk sort who is launching people into space, an endeavor seemingly paid for by the profits of his pharmaceutical company, but an accident with a returning spacecraft puts his operation into question and Eddie is instructed to basically do a puff piece to rebuild the public’s confidence. But that’s not Eddie’s style and he discovers Drake is up to something that requires human subjects … who all seem to end up dead. Drake’s astronauts have been collecting organisms from outer space and bringing them to Earth, hoping to combine them with humans in order to allow humans to live off planet. But the sentient organisms, or symbiotes, have other plans for the planet. Like Eddie and his symbiote, which goes by the name Venom, the movie never meshes well for several reasons. The first is the movie’s attempt at humor. I assume the comic book version of Venom is a real wisecracker and I can see how that would work in a comic. But when you put that in a movie that wants to be a dark, gritty, sci-fi action movie with an actor not known for his comedic chops, it just doesn’t work. It’s like when Freddy Kruger basically became a stand-up comic with one-liners for every kill instead of the figure that struck fear into the hearts of those who dreamed about him in the first movie. The wisecracks don’t make Venom threatening. Of course, being set in the Spider-Man universe (and even a quick cameo would have been welcome), the movie has to maintain that humor that works much better in the Spider-Man movies than it does here. And it also has to maintain a PG-13 rating … which is really the biggest crime here. 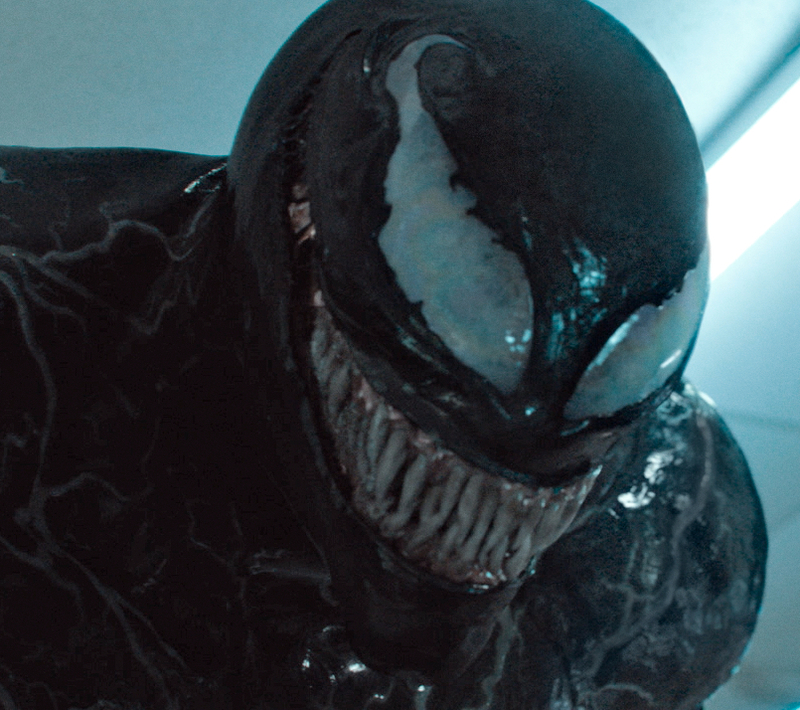 Venom should have been a hard R, and they should have amped up the comedy and the violence to Deadpool levels if the comedy had to be a part of the movie. It really should have been more Logan in tone though. Leave the comedy out completely and just go for dark and violent. I don’t know how many people lost their heads to Venom, but the carnage was ridiculously bloodless. And don’t get me started on Venom’s tongue. What works as a still image on the page does not necessarily look right when put into motion. Another of the film’s issues is the casting. I like Tom Hardy and Michelle Williams very much. Hardy is fantastic in just about everything he does, and most of that stuff is drama or action – Mad Max: Fury Road, The Revenant, Taboo, The Dark Knight Rises, Bronson – you’d be hard-pressed to find any real comedy on his resumé. And for good reason as this movie demonstrates. At points he’s required to over-react to something with wild facial expressions or vocal reactions, and he just is not the person to pull that off. He’s great as the serious Eddie Brock, but he just can’t do goofy. Michelle Williams, who was terrific in I Feel Pretty, is just terribly miscast here as Eddie’s love interest. I felt that she felt out of place, and all I could think was that is was a shame Gwyneth Paltrow was already committed to Pepper Potts … and I’m not even the biggest Paltrow fan. Riz Ahmed comes off the best here because he’s consistently working in a movie that is a drama. Half of Venom works, half of it does not. If you don’t know the character is from the Spider-Man universe, you’d never know it from the movie. There’s really no reference to the character – except a name drop of one of Drake’s astronauts, JJ Jameson III – so why try to keep Venom beholden to that universe? Drop the attempt at being light-hearted and just go for dark and violent with the next movie (I fear though that won’t be remotely possible just by what we see in the credits teaser). I really wanted to like Venom but in the end it just did not click.